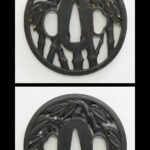 Special feature : This Tsuba is probably made by Tomita Masayoshi of Inaba. Round shape iron Tsuba, tidal wave engraved with gold inlay. The condition is good.